With this "virtual postcard" I wish all of you a very happy 2001. Below are impressions from my Christmas 2000 - I hope your Christmas was as good as mine. 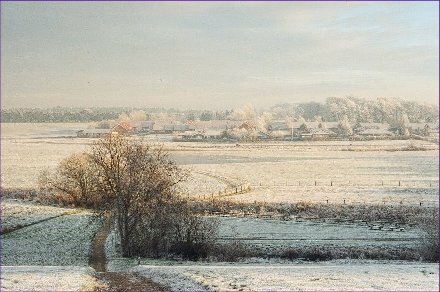 I spent Christmas 2000 (December 22-26) with my boyfriend and his mother in Sindal (the Northern part of Denmark, very much "the countryside" compared with home/Copenhagen). This picture was taken from Sindal, looking out over the fields, after days of freezing cold - no snow, but lots of ice on the trees. And this picture is a close up from the Christmas tree. 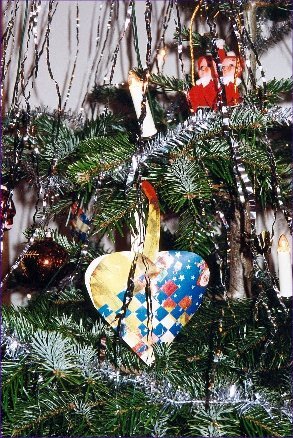 The heart is a variation on a theme - the technique is well known in Denmark, but the choice of paper is a bit unusual.